Zostaw swoje dane kontaktowe, odezwiemy się, aby umówić Cię na wizytę. Meet our Rojek Dental Clinic Team We are experienced professionals offering services in aesthetic dentistry and prosthetics. We show commitment to the needs and problems of every patient. 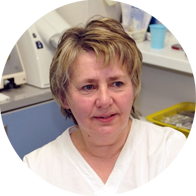 In 1998 graduated from the Medical University of Białystok with the degree of Doctor of Dental Science. He gained his professional experience working in Regional Specialized Children’s Hospital in Olsztyn and 103rd Military Hospital with Regional Specialized Clinic. Currently he is employed at Regional Psychiatric Hospital in Olsztyn and runs his private dental clinic. 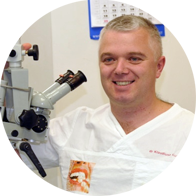 For a few years (2005-2009) he was the President of the Polish Dental Association in Olsztyn, currently he’s the member of its board of directors. He specializes in aesthetic dentistry, microscopic endodontics and prosthetics. To improve and master his dental skills in various areas of dentistry such as malocclusion treatment, implants, teeth whitening or prosthetics, he participated in numerous courses and trainings abroad. During his recent training he earned the degree of master of prosthodontics. After work, he spends free time with his family and enjoys extreme sports. Dental assistant with a few years of experience in dentistry. She constantly enhances her knowledge and upskills during various trainings for medical professionals. She devotes her free time to family and her hobby, painting.